One of the best days of my life was opening day at Vail in 2005. A tremendous winter storm had just dumped over five feet of snow on the mountain. The sun was shining and the conditions had never been better! It's hard to believe anything could top this winter experience, but Vail's not just a western ski town. It's a summertime paradise that the whole family can enjoy, too. You'll soar like an eagle in a hot air balloon, raft the white water rapids and fly fish for rainbow trout. Maybe you'll hike to a crystal clear mountain lake, get pampered at the world-class spas and dine at fine restaurants. 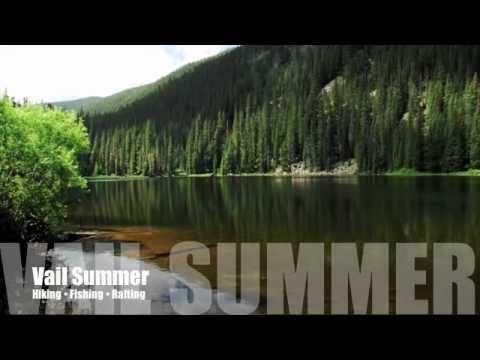 Summertime in the Rocky Mountains offers something for everyone to experience and enjoy! Lots of carriers fly in and out of Denver International Airport (DEN) so finding a flight from wherever you're coming from shouldn't be too difficult. You can also fly into Eagle County Airport (EGE), which is only 30 miles from Vail. You won't need a car rental. The Colorado Mountain Express shuttle departs for Vail on the hour and the trip costs $78 per person one-way. Gratuity is not included. Sunday is the best day to travel the I-70 since most tractor-trailer drivers take the day off, leaving the roads open for a pleasant drive. The Colorado Mountain Express check-in process is simple and fast. Your luggage is loaded onto open carts. Don't check your laptop or other electronic equipment. It can accidentally get misplaced like mine did. The good news is that the people who run this company are honest and so are their employees. My Apple Power Book was returned to me the same day. Colorado Mountain Express, Tel: 800-525-6363. I arrived at the resort late Sunday afternoon. It's situated in Cascade Village alongside Gore Creek. It has 292 luxury guest rooms with mountain or courtyard views and 82 condominiums and private residences. The resort is undergoing a gradual $30 million renovation, which will include air conditioning. The lobby is welcoming with a rustic stone fireplace and freshly cut flowers. The front desk check-in area is located off the lobby. If you have to wait for a guest host, there is a comfortable sitting area that doubles as a library with complimentary WiFi access. Getting to your room can be a little tricky due to the layout of the resort. Have a bellman assist you so you won't get lost. A standard room is 390 square feet but if you'd like a little extra space, ask for a corner room, which is slightly larger. The room decor is on the dark side and the wood furnishings are contemporary. The beds are firm and sport pillow top mattresses. The accommodations on the ground floor have French doors that open onto private patios. These are my favorite rooms during the summer because they provide easy access to the pool and the hot tub spa. You can also listen to Gore Creek at night or watch the constant stream of friendly runners, cyclists and strollers pass by on the bike path. There are numerous amenities for guests to enjoy including two heated outdoor pools, seven tennis courts, a health club and spa, three hot tubs, sauna, concierge, shopping arcade including sporting-goods stores with rentals and apparel, 24-hour room service, massage and babysitting services. If you're driving to the resort, valet parking is $20 per day and self-parking is $15. The free shuttle runs every fifteen minutes to the Vail Village and this is the best way to get around during your stay. A courtyard room starts at $139 during the summer months and mountain view accommodations will set you back $159 a night. Vail Cascade Resort & Spa, 1300 Westhaven Drive, Vail, CO, 81657, Tel: 800-282-4183. After getting settled in, it was time to check out The Aria Spa & Club. It's part of the Vail Cascade Resort. The 70,000 square foot facility is Vail's largest. It's located just a short walk from the main lodge next to the indoor parking garage. To get there, walk towards the main entrance of the resort and cross over Westhaven Drive. You'll see the entrance to the spa located on the second floor.